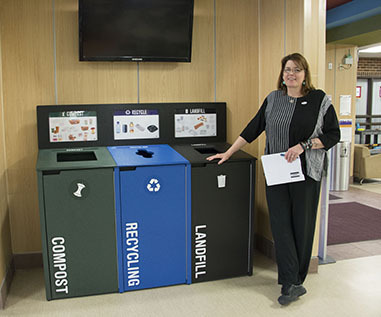 Photo on left: McHenry County College Sustainability Center director Kim Hankins displays the new recycling bins in the college’s Commons area to kick off the college’s new food scrap composting program. 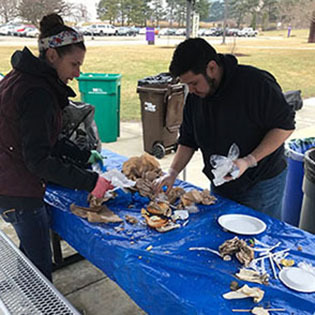 Photo on right: Jennifer Kainz of Mindful Waste, a non-profit group in Barrington, left, and MCC student Luca Palacios, president of the college’s Environmental Club, sort through food scraps from MCC’s cafeteria during a waste audit to determine how much the college is sending to the landfill. McHenry County College (MCC) is leading the way in McHenry County and beyond to compost food scraps from its cafeteria and dining area. This effort is the latest initiative by MCC’s Sustainability Center to reduce the college’s carbon footprint and enhance MCC’s commitment toward being green. As part of the college’s overall commitment to sustainability, food composting efforts began last August behind the scenes with the kitchen and culinary classes. Beginning April 1, the college launched a food scrap composting program by installing new recycling bins in the MCC cafeteria and Commons area. Staff and student volunteers have been assisting people to sort their food waste, paper and plastics and other waste from their cafeteria trays during the lunch hours. “People are really curious and interested in how to what to do it right,” said Kim Hankins, MCC Sustainability Center director, referring to students and college employees who are getting used to the new system of sorting their garbage into composting, recycling or landfill receptacles. “Our goal is to reduce the college’s carbon footprint. Less waste means less waste hauler trucks coming to and from the college and less waste in the landfill,” Hankins said. “We hope to eventually scale back our waste hauler service, which in turn, saves the college money. “Food waste takes up a huge part of the waste system, so composting food scraps means less waste goes into the landfill, which extends the life of the landfill,” Hankins added. In addition, she said composting is good for the economy, good for our bodies, good for the air, and good for water conservation. In fact, studies have shown that when food is landfilled, it decomposes without air and creates methane, a highly potent and harmful greenhouse gas. To measure the impact of the new program to compost food scraps, the college conducted a waste audit on April 5, where students and staff volunteers sorted, measured, and weighed food scraps the cafeteria kitchen, dining area and culinary labs. The audit resulted in 163 pounds of food compost and 87 pounds of recycling that would have ended up in the landfill. Luca Palacios of Woodstock, president of MCC’s Environmental Club, said he is excited about the composting program. “I’m glad to see we’re making a change (to waste disposal) that’s permanent. It’s important because it’s a lot of waste. People need to take the effort to separate materials into their respective containers,” he added. Hankins has been working at the college for the past six years to implement initiatives to support green campus, green curriculum and green community. “The composting program addresses all three initiatives by reducing the college’s carbon footprint, teaching students about composting and boosting the green economy in northern Illinois,” she said. Other college-wide sustainability efforts have resulted in the MCC Café becoming a 3-Star Certified Green Restaurant, making MCC the only community college in the U.S. to reach this level as of last fall. In addition, MCC hosts annual Green Living Expos, which have resulted in at least five new solar installations added in McHenry County. Plus, MCC offers 70 classes each semester that have a green component in their core lessons plans. MCC also offers a LEEDS credit class in the Construction Management program and added the specialty option of Urban Agriculture in the Associate in Applied Science (AAS) degree in horticulture. Hankins said she will introduce a new sustainability effort this summer—Event Kits for employee department luncheons. Instead of using disposable tableware for certain events, employees will be able to check out and return a kit with plates, cups, utensils, and table cloths--all items that can be washed and reused.